The Young and the Restless (Y&R) spoilers tease that Graham’s (Max Shippee) back with a specific goal in mind. Traci (Beth Maitland) will get a shock on this week’s new Y&R episodes so that will be when Graham reveals himself to the Abbotts. He’ll have a smug attitude and quite an agenda. Dina (Marla Adams) tends to forget what happened on any given day, so she’ll cling to her companion now that he’s in town again. The Young and the Restless spoilers say that’ll be another source of contention between Graham and the Abbotts. Jack (Peter Bergman), Ashley (Eileen Davidson) and Traci are in for some stunning moments. Graham has news that will ultimately send them to court. Ashley will hire an aggressive attorney named Tony Kingsman (Michael Masini), but Y&R spoilers hint he may be more trouble than he’s worth. Tony won’t be afraid to deliver low blows in the courtroom. Of course, Graham will be prepared with a few of his own. He has some secrets that could turn Ashley, Jack and Traci’s world upside down. 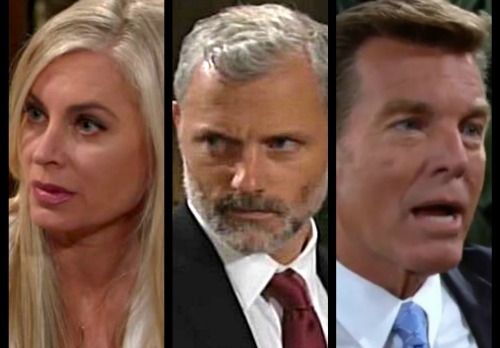 The Young and the Restless spoilers state that Graham will supply a serious bombshell in court. What could that be? We know that Jabot will face some chaos soon. Jack also mentioned an intriguing amendment recently. The company has to be run by someone who’s an Abbott by blood. Y&R offered a bit of mystery about Graham’s paternity but never resolves the issue. Brent Davis was Graham’s stepfather, so it makes sense that his biological father will be revealed at some point. Why else would they choose to take the stepdad route with Brent? The Young and the Restless spoilers say something major brewing. Graham’s updates will rock Genoa City in a big way, so be prepared for a real surprise. Could Graham secretly be an Abbott? If John (Jerry Douglas) was his father, that could set up some interesting Jabot drama. Ashley and Jack have been vying for the CEO position lately, but Graham could take them to court in hopes of stealing the spot. Graham would have more of a say about Dina’s will as well. Dina will undoubtedly be oblivious to everything Graham did during his last stint. She’ll probably be ready to throw all kinds of cash and assets at him. On a side note, it is interesting to see how under Mal Young’s fearless leadership Dina Mergeron has been transformed into the most dangerous person on Y&R – Stabbing, Arson, Child-stealing – what’s next!?! 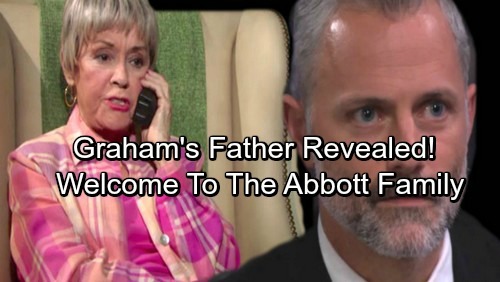 When Graham’s paternity bomb drops, you can bet that the Abbott clan will have to deal with a mess! We’ll keep you posted as other Y&R details emerge. Stick with the CBS soap and don’t forget to check CDL often for the latest Young and the Restless spoilers, updates and news.